The karate chop, also called the knife hand strike, Shuto or Tegatana, is a strike which uses the part of the hand opposite the thumb. In martial arts this technique is usually practiced on wood and bricks. 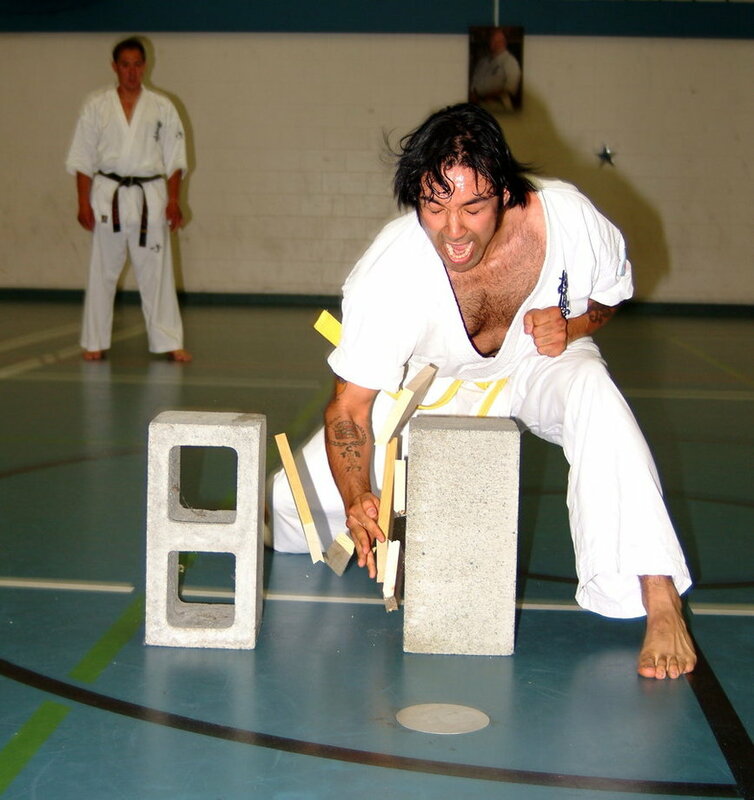 People usually think that it requires a lot of force to karate chop a wood or a brick but actually it is a mental game that does not require a particularly great amount of force. Before attempting to break the wood with a karate chop, it is very important to familiarize yourself with some professional karate instructions. Follow the steps below and master one of the most popular karate moves. Start by properly setting the wood on two chopping blocks. Make sure the chopping blocks are stable and would not fall down as you strike the wood. It is also crucial to adjust the wood in the right direction, with the grains running parallel to the line which will be broken. The next step is to get into stance. You can attempt the karate chop while standing as well as sitting. If you want to chop the wood while standing up, your legs should be shoulder width apart, and if you are kneeling down then your knees should be perpendicular to your shoulders, a couple of feet away from chopping blocks. Since the key to successful chopping is peace of mind, you need to stay as calm as possible before attempting the strike. Establish the right frame of mind by imagining your hand going through the wood. Once you have established the right frame of mind, position your hand in such a way that your thumb is next to the pointing finger. Tauten your finger tips to create even more rigidity and slightly bend your fingers to left, (if you are a left-hander, bend fingers to right). Lift your arm high up into the air and shoot your hand down briskly, hitting farther until you chop the wood. Do not lift your hand up immediately, allow your hand to go all the way through to make the break without injuring yourself. There is a possibility that you may not be able to break the wood in the first attempt and may also end up injuring your hand. Do not give up, remember the rule of thumb, practice makes a man perfect. The more you practice, the more accurately you will hit the wood, and finally break it.